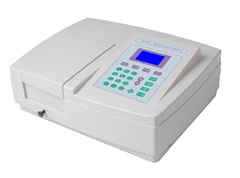 This is advanced Double Beam UV-VIS Spectrophotometer with more accuracy and flexible requirement. The two detectors are used to measure sample and reference respectively and simultaneously for optimizing measurement accuracy. It has vide wavelength range satisfying requirement of various fields, such as biochemical research and industry, pharmaceuticals analysis and production, education, environment protection, food industry etc. Up to 10 standard samples may be used to establish a curve, four methods for fitting a curve through the calibration points: Linear fit, linear fit through zero. Square fit and cubic fit. 2. Hi, Medium and Low scan speeds are available. They vary from 100 to 3600 nm/Min. 3. Wavelengths are scanned from high to low so that the instrument waits at high WL. And it minimize the degradation of UV sensitive samples. This mode may be used for time course scanning or reaction rate calculations. Abs vs time graphs is displayed on the screen on real time.